Captain John Pridgeon worked his way up on the Great Lakes from earning pennies to becoming a millionaire, but he suffered family tragedies along the way.His brothers Robert, Elijah and sister Charlotte all died tragically and Captain John had the responsibility of identifying their bodies. His two brothers Robert and Elijah died when the boiler in the tug that he owned, the W.K. Muir, exploded in the St. Clair River below Port Huron in September 1867. In March 1874, Captain John had to help bury his sister Charlotte after her lover William Thomas Underwood stabbed her to death in the doorway of her boarding house in Detroit. Captain John Pridgeon and his brothers and sisters were born in Lincolnshire, England. In 1840, the entire family immigrated to America and settled in Greenfield Township, near Detroit, Michigan. When he turned thirteen, John found work in Detroit as a teamster, driving the stage between Detroit and Mt. Clemens and working as a cook on a Detroit River scow, earning twelve dollars a month. He drove teams during the winter and sailed in the summer for three years, and when John Robinson built the steamer Boston, John Pridgeon signed on as a deck sweeper and later was promoted to deck hand. That summer he sailed on the Boston for twelve dollars a month and worked in a livery stable during the winter. No matter how small his salary, he always put a portion aside for his future. His frugality laid the foundation for his future substantial fortune. John Pridgeon’s love of the sea grew right along with his years and when he turned eighteen, he traveled to New York and enlisted as an ordinary seaman in the United States Navy. He trained on the receiving ship North Carolina and then the Navy assigned him to the United States sloop Albany of the South Atlantic Squadron. While serving on the Albany, John visited the West Indies, South America, and most of the other Southern ports. In 1851, the Albany sailed home carrying many of the American citizens who had taken part in the Cuban insurrection. The Spanish government had surrendered them to the United States authorities and John and his crew members guarded them and monitored their home coming. Captain John returned to Greenfield with $500 in his pocket, his savings from his three year cruise. Shortly after this, he came to Detroit and shipped on the small steamer Telegraph as a wheelsman. That winter he bought a team and a pair of bob sleds and worked in the lumber woods near Lexington, returning to Detroit at the end of the winter with a capital of $800. He continued this working pattern of teaming and sailing for two or three years until he totaled his net worth at about $3,000. Eventually, he sold his horses, wagons, and tools and bought a little steamer, the United, the first steamboat he owned. He used the United to haul sand from Fort Wayne, which he used in the first paving ever done in Detroit. Along with his first steamer Captain Pridgeon acquired his first and last wife when he married Miss Emma Nicholson, the daughter of a Canadian farmer who lived about eight miles outside of Windsor. He brought his wife and small son, John Pridgeon, Jr., a baby still in his mother’s arms, to live on the United. Captain John Pridgeon cleared about $4,000 his first season on the United and about $3,500 the second. After three years, he sold the United for $4,000, leaving him with about $12,000 profit, including his home. The next season, Captain John bought the propeller Napoleon from Oliver Newberry for $6,000 cash and conducted a general towing business in the North Channel at St. Clair flats. After that, he sold the Napoleon and purchased the steamer Canada to use in the towing business. From 1866 to 1884, Captain John owned one of the largest fleets of tugs, steamers and sailing vessels at the Port of Detroit. On September 19, 1867, one of the tugs that Captain John owned, the W.K. Muir, had just taken up a tow consisting of the bark City of Buffalo and another vessel and was proceeding down the St. Clair River. When the Muir was about half a mile below the City of Port Huron, a sudden boom shattered the air. The boiler of the Muir, commanded by Captain Robert Pridgeon had exploded. Captain Robert Pridgeon; first officer Elijah Pridgeon; John Kirchean, first engineer; William Bampton, clerk and lookout; Jim and John the firemen, and Charlie, the cook, were killed. Wounded were Thomas Daniels of Buffalo whose face was seriously scalded and bruised; Walter Cartwright with a severely injured spine; and Oscar Cartwright, wheelsman, with a foot and back injury. Michael McQueeny was wounded slightly in the foot and James Scofield, second engineer, had his feet scalded. Captain William O’Neil of the tug Red Eric, went to the rescue of the wounded who were taken to the Larned House for care. The Muir was a total wreck and Captain John Pridgeon had carried no insurance on it. Immediately after hearing about the accident,Captain John Pridgeon left for the scene to find out the true facts of the case and to recover his brother’s bodies. The bodies of Captain Robert Pridgeon and four others were recovered several miles downstream a few days later. Robert and Elijah Pridgeon were well known and had been connected with their brother, Captain John’s tug, the Muir, for some time. They were both married and left families in the city. Losing his two brothers on one of his own tugs was not the end of Captain Pridgeon’s troubles. Next, he would have to identify the body of his sister Charlotte Pridgeon. The killer of Charlotte Pridgeon was William Thomas Underwood, a thirty-three-year-old Englishman, who was a sailor by trade and also worked in the Detroit ship yards. He came to the Straight house to see Charlotte at about seven o’clock the evening of the murder. They went for a stroll and after they returned to the house she said good night to him and rapped on the door. The coroner’s jury returned a verdict that Charlotte Pridgeon had died from a wound inflicted with a knife wielded by William Thomas Underwood.The Detroit News devoted another story to the murderer. A native of London, England, Underwood had been in the United States for 14 years and had worked in several lake ports over the past ten years. He had been married and had lived in Cleveland, but he and his wife had separated because of his drinking. The first time Underwood saw Charlotte Pridgeon was November 29, 1873. He was boarding at the home of her sister-in-law Mrs. Eliza Pridgeon and Charlotte had come to stay there. She had been keeping company with three or four young men, but according to Underwood, she dropped them to be with him. Underwood told Charlotte that he loved her on Christmas, and she agreed to go with him and give up everyone else. He said that Charlotte was always changing her boarding place, staying with one sister or sister-in-law and then another. The News reporter asked him if Charlotte had found out about his wife in Cleveland. Underwood said that Charlotte had written to his wife in Cleveland and received the answer that the marriage was over. Underwood said that he and Charlotte were engaged, but then he discovered that she had gone out with another man. “I was out of my senses and I did not know what I was doing. My heart was nearly bursting and I could hardly see anything before my eyes. I am the murderer of my love,” he told the News. William Thomas Underwood was charged with the murder of Lottie Pridgeon at Detroit by stabbing her. He admitted to the killing and seemed to have no possible provocation or excuse. Public sentiment was so strong and the press so against the prisoner that the judge presiding over the case expressed surprise that any defense should be attempted. The defense was emotional insanity and the prisoner was acquitted. There is no record of Captain John’s reaction to the acquittal of the murderer of his sister, but he surely did not consider his sister’s murder one of the positive parts of his life. On the other hand, his investments were almost always successful, and during the last years of his life he converted his business into a contracting business, disposing of ships when he could do so profitably. He operated his firm of John Pridgeon & Son, a large and lucrative vessel trade and he considered his son, John Jr., one of the most positive parts of his life. 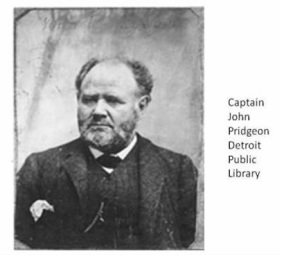 For eight years, Captain John served on the Board of Water Commissions of Detroit and while he served on the Board he helped make many improvements to the water works. His employers on the board cordially esteemed him and when his term of office expired he retired from public life with the respect and goodwill of his associates and of the public. He died on December 6, 1894, believing to the last that being a millionaire was a mixed blessing. Farmer, Silas, History of Detroit and Michigan, 1889. Cyclopedia of Michigan, New York and Detroit, Western Publishing and Engraving Company, 1890. Rubenstein, Bruce and Ziewacz, Lawrence, Michigan: A History of the Great Lakes, Harlan Davidson, 4th Edition, 2008.